Free – visitors only pay for parking. 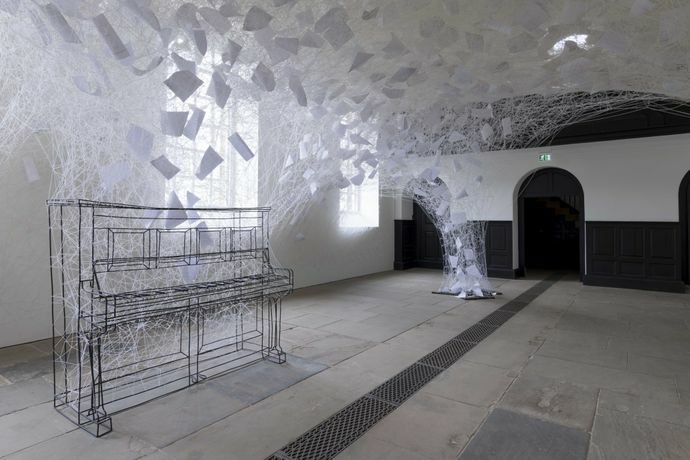 Acclaimed installation and performance artist Chiharu Shiota has created an awe-inspiring, site-specific installation of thread within the beautiful 18th-century Chapel. Shiota is known for large-scale works such as The Key In The Hand (2015), an elaborate entanglement of red thread and keys, which she made when selected to represent Japan at the 56th International Art Exhibition – La Biennale di Venezia. Shiota’s work for YSP responds to and activates the unique architecture and heritage of the Chapel. Exemplary of her work’s resonance with memory and human relationships through the use of objects, the installation has interlaced the physical with conceptual to create a new visual plane – as if painting in mid-air.